Wilson Optical Center is part of Medical Eye Associates PA. It is located in the same building as Medical Eye Associates for your convenience. 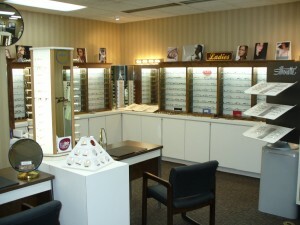 The center has been operating for over forty years and the staff opticians have a combined 65 years experience. The optical center being associated with a group of ophthalmologist has a vast knowledge of the more difficult prescriptions than the average optical center. We accept eyeglass prescriptions from other eye doctors also. The center deals with post operative patients, low vision patients as well as the normal prescriptions that correct near and far sightedness and the correction of astigmatism. The optical center specializes in the fitting of progressive no line bifocals and has the correct style lens to meet your needs. Sunglasses are a must these days and we have available non prescription and prescription sunglasses. Ray Bans, Costa Del Mar, Anne Klein, Columbia, Saks Fifth Avenue and many other styles are available. Having one of the largest frames collections in the area its easy to find the perfect frame to meet your needs with style. The collection includes low to moderate prices for your selection. Many designer lines are available. Trying to meet the needs of our patients and customers, we do accept most vision plans. Be sure to make us aware of your insurance coverage. If you have questions be sure to call or come by and talk to one of our licensed opticians or trained staff members.